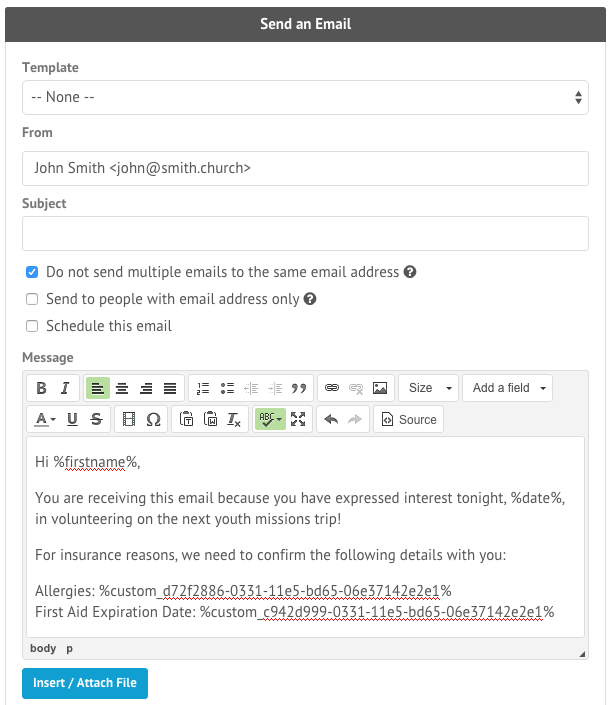 Placeholders in Tithe.ly ChMS are a valuable tool, particularly when sending out bulk emails or generating address labels. When used in an email, placeholders look up the appropriate information for the recipient, and in some cases, the sender of the email. When used in a label, they look up the information for the intended recipient of the label. For a full list of placeholders, please refer to this article. Here is an example of an email being composed using several placeholders. This example uses several different placeholders to automatically enter the correct data for the recipient. Some of these are rather self-explanatory, such as %birthday%., but the %custom_…% placeholders are a little harder to understand. These placeholders refer to custom fields that have been created in People Categories. Below is an example email that utilizes placeholders. As you can see, the placeholder %sender_name% did not go through, as the email was sent from an email that is not attributed to any users in the database. The other placeholders, however, have referenced the appropriate information that exists for Peter in his profile. A list of available placeholders can be found by clicking the ‘Add a field’ button on the top right of the edit box. View this article for a list of all placeholders included by default. Placeholders are also used when generating address labels or check in labels. While there are few other settings to keep in mind when generating these labels, placeholders work exactly the same within them. A group of people are selected, and the placeholders reference the appropriate data from the persons profile. The placeholders to use for specific labels can be found by navigation to Settings and once the page loads, selecting Account. 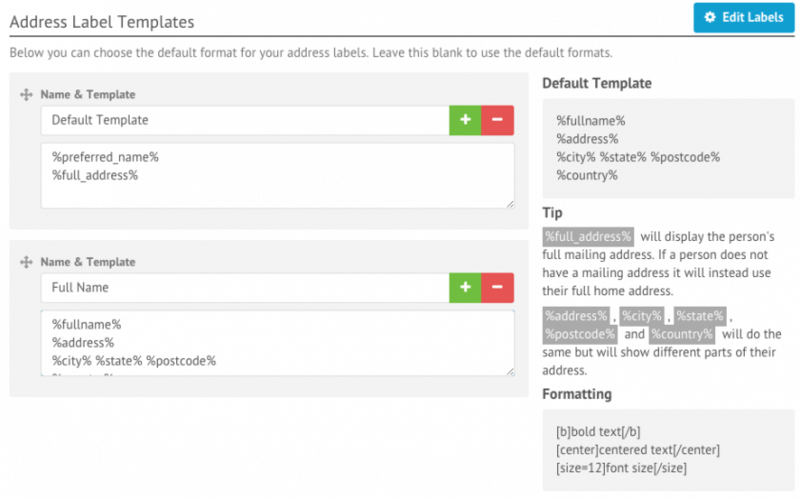 From there, scroll down to the ‘Address Label Templates’ or “Name Tag Templates’ heading. To customize these templates, click the ‘Edit Labels’ button to show a list of available placeholders. To use one of these placeholders, simply click and drag the placeholder into the template you wish to use it in. We have other articles for more information on printing Address Labels and Name Tags.